Read about George, a Jack Russell Terrier from New Zealand. He's truly a hero. SPOILER ALERT: Things don't end well for George. You must read the Evil Hamsters poem if you missed it. While I disagree with the sentiment, I admire the author's talent. 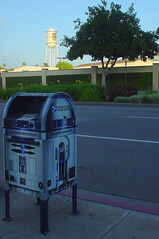 I finally got a photo of one of the two R2-D2 mailboxes that I've seen in Burbank, which are both near studios. This is the one by Warner Brothers, in front of the Taco Bell on Olive. In the background, you can see the WB water tower, where the Animaniacs live. The Silver Lake Film Festival opens tonight. It will be consuming a lot of my time over the next ten days. One of E's short films is in the fest, so I have a free pass. It looks like it's going to be a great festival this year, with a lot of film and music events. I guess I'll be seeing the Circle Jerks later. Cool. I'm already behind on updating here. I've uploaded photos that have yet to be labeled, etc. Someday. Someday. Yes, poor little George is hailed as a real hero over here at the moment. A woman was mauled to death by tearaway pitbulls here about one week before this and that little dog certainly saved those kids from a terrible mauling. The festival sounds a blast ... hope you have a great time.